Create a selection menu of project pages, also called a “jump” menu. 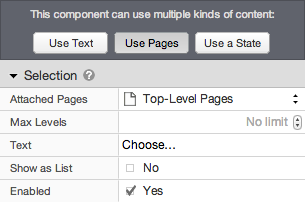 A page-based selection creates a pop-up menu or single-select list of project pages. Selecting a page from the list navigates to that page. It is commonly used to present a set of links in a compact way. Attached Pages The page-based selection can select its starting pages automatically based on a “preset”. You can choose to display the direct children of the project home page (the “top-level” pages), the siblings of current page, or the children of the current page. Custom Level * Enter the level at which you would like the selection to start. Maximum Levels The maximum number of levels of pages to show in the selection. Leave this field blank to show all levels. Text The text to show in the pop-up menu. Leave this field blank to have the selection show the current page (if it is included in the list).